Nicknamed as the entertaining city of the world, Las Vegas is heaven for travelers. The tours of the city can be categorized as leisure and city oriented tours. Leisure tour involves indulging in the luxuries, entertainment and gambling attractions of Las Vegas. While the city tour involves roaming in the city and visiting different highlights of the city. Either way a well guided tour of the Las Vegas city requires a car hire. Las Vegas is a city where tourists can enjoy different kinds of tours. Nature tour of the Las Vegas city could take you to the Southern Nevada Zoological-Botanical Park, Bellagio's fountains, Las Vegas Springs Preserve and Floyd Lamb State Park. Entertainment tour of the Las Vegas city means enjoying exotic dinning, extravagant shopping, gambling and amusement shows. The nightlife of the Las Vegas city is world famous for enjoying diverse attractions. Even sport enthusiasts will find many clubs and centers for the same. Luxury resorts of the Las Vegas city is place where travelers can relax and have a splendid time altogether. In the exterior part of Las Vegas city tourists can enjoy mountain activities as part of outdoor excursion. Tourists can take part in activities like biking, hiking, camping and backpacking. If tourists are planning to spend a vacation in Vegas, a car hire is the best option to tour around. The basic concept of traveling is to have a leisure time and exclusivity. 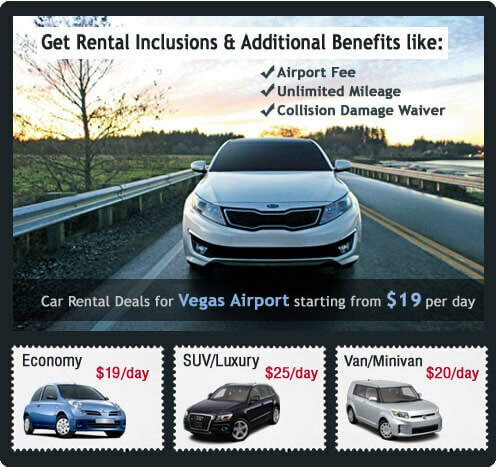 This is what you get with a car hire from Vegas Airport Car Rental, an exclusive car on most nominal rents. Vegas Airport Car Rental also saves most of your travelling time, because you have your own transportation facility. With Vegas Airport Car Rental you can also go for a prior booking, so you have a car waiting for you on your arrival at Las Vegas city.